Senior Team Management – The club would like to take this opportunity to pass on our sincere thanks to our senior management team who have made the decision to step down. We would like to thank Manager Paul Prior and his selectors Jason Kellett, Sean McCartin, Paddy Prior and Joe Feeley for the tremendous work they have done for the club over the last three years. During this time we have won an intermediate championship, played in Semi Finals of the senior championship and contested the league final. The management team hhasdone fantastic work developing a group of fine young men into a team that has grown in stature and belief during their time in charge. The brand of football they have developed and instilled in the team was exciting to watch and helped draw new and old down to the Páirc. We would like to thank them for the time, effort and dedication they have shown the club and wish them well in the future. Underage Amalgamation – It was announced recently at a club meeting that our underage teams comprising the under 13, 15’s and 17’s would amalgamate with Kiltubrid GAA. The new team will be called Seàn MacDiarmada Gaels with the colours black and amber and the St Bridget’s cross as a crest. Black and amber represent the original Leitrim GAA colours and the St Bridgets cross is symbolic of both Ballinamore and Kiltubrid. We would like to wish the new club well for the coming season and encourage anyone that would like to assist in the set up of the new amalgamation to make themselves known. Scór na nÓg and Scór Sinsir – We are currently looking for participants for the 2019 Scór na nÓg and Scór Sinsir. 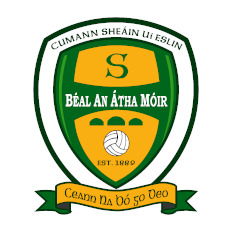 Ladies – U16 Ladies – Best of luck to our U16 team who play Glencar Manorhamilton at 12pm on Sunday 18th November in Boggaun. The girls are undefeated having won all three games in the Championship so far and can hopefully make it four on the spin. Minor Ladies – Hard luck to the Minors who gave it everything against Kilkerrin Clonberne in the Connacht semi-final on Sunday but unfortunately came out on the wrong end of a 4-12 to 1-8 scoreline. The team made giant strides this year, playing some fantastic football in the process of becoming the County Champions and everyone in the club is hugely proud of their efforts.